Learn the De Puy Attune Total Knee Replacement surgical technique with step by step instructions on OrthOracle. Our e-learning platform contains high resolution images and a certified CME of the De Puy Attune Total Knee Replacement surgical procedure. A total knee replacement is one of the most commonly performed and successful operations available, with 85-90% of patients achieving significant improvements in pain. In excess of 70000 are performed in the NHS per annum. In this case the patient is a 76 year old female with widespread symptomatic osteoarthritis. She had exhausted conservative measures to combat the pain but was still suffering significant negative impact on her quality of life on a daily basis. She was counselled that the procedure is a pain-relieving operation only. It would not predictably improve her pre-operative range of motion. This is vital for the patient to grasp as many seek total knee replacement as a “cure for stiffness”. However due to retraction of the soft tissues, including the joint capsule, gastrocnemius tendons and hamstrings, resurfacing of the distal femur and the proximal tibia is not guaranteed to eradicate a fixed flexion deformity of improve on flexion. There are techniques, which will be described, to try to help however no assurance should be offered by the surgeon, so as to avoid disappointing their patient. This particular implant namely the Depuy Attune is, at the time of writing, fairly new onto the market. It is therefore advisable, and indeed my practice, to closely monitor and audit the results of surgery versus a well-established implant. As well as submitting data to the National Joint Registry it is also my practice to record pre- and post-operative patient-reported outcome measures and any complications, all with the patient’s prior consent. To date these show an average improvement of 23.5 points on the Oxford Knee Score scale or “change score” at 6 months, which compares favourably to the NJR published average of 16.5. One-year averages have increased to 26.3. 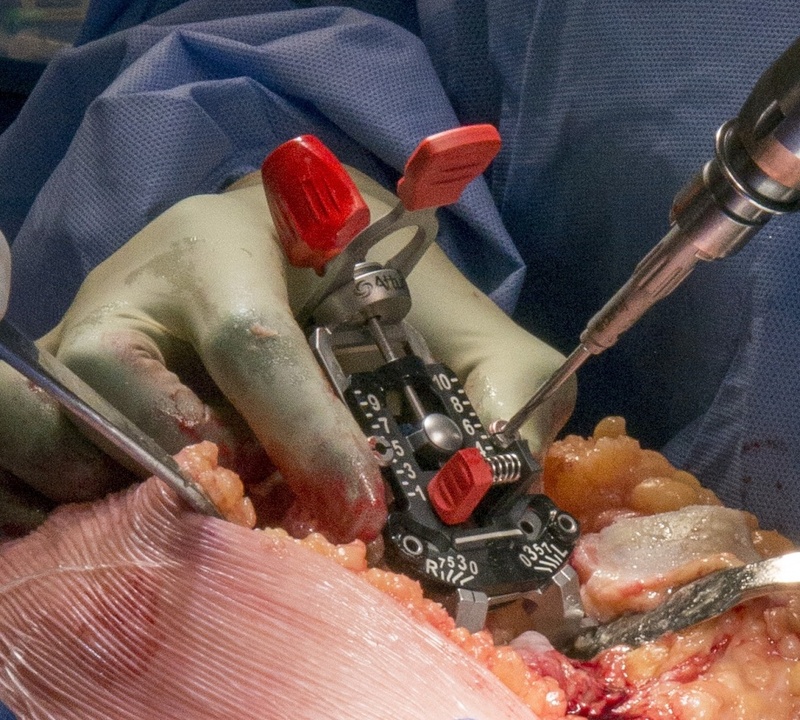 The procedure described is a left cemented total knee replacement with a cruciate retaining fixed-bearing implant, using the measured resection technique. However there are several technical options available with the De Puy Attune including instrumentation for balanced resection. The femur can be sized by both anterior and posterior referencing. As well as versatility from an instrumentation perspective the implants options are also broad with standard and narrow femurs and 1mm increments between tibial inserts. In my own experience one of the simplest and yet most helpful feature is the low profile tibial trial tray. Often thicker trays impinge on the lateral femoral condyle and inadvertently internally rotate the tray relative to the pre-cut posterior slope (improved patellar tracking; avoidance of varus tray positioning). However the De Puy Attune tray is free to rotate in the optimal position as the low profile can slide under the lateral femoral condyle. I also feel that the instrumentation stands up well in knees with limited flexion (stiffness; obesity). Furthermore my patients ROM recovery with the Attune has been significantly quicker than my previous experience.